Sometimes, ideas take their time in coming to fruition, but more often than not, the fruition is pretty freaking amazing. Okay, I think I've maxed out the number of times one can say fruition before it no longer sounds like a real word. My cinnamon rolls earned me a pretty fantastic, manly-handed husband. They are one of my most loved and repeated recipes, and I knew that if I could somehow coerce them into a cozy, cream cheese-covered romance with one of my other favorite indulgences - banana bread - well, it would be magical. It was. It really was. Taking a bite of these cinnamon rolls was like strolling into Magic Kingdom for the first time, minus the stifling humidity and staggering number of baby strollers. The primary reason these rolls were so long in the coming was that I could not make up my mind on where the bananas were to go. Would I mash them into a paste for filling the cinnamon-dusted spirals? Should I caramelize them first? Or would I dare to add a whole lot of extra moisture and weight to my favorite airy sweet dough? In the end, I opted for possibly the most challenging of my options, but after taking that first bite, I knew I had made the right choice. With a little finagling, my favroite yeast dough became a banana-flavored daydream. And because, like brownies, banana bread is not banana bread without a generous dose of walnuts, I was determined to include a couple of handfuls. I live this life of mine by one very sound principle. Walnuts are good. Walnut praline is better. While they may sound a little involved, these rolls truly come together quite simply. 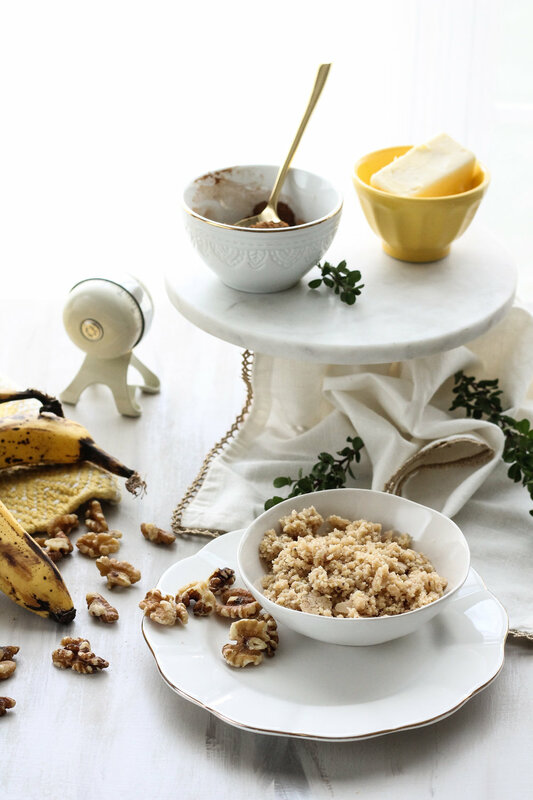 The walnut praline will be cooked, cooled, and crumbled by the time your banana dough is done rising. I ground the praline up in my food processor to create fine crumbs that could easily be tucked inside these oversized rolls. I also whipped a bit of the leftover praline into the cream cheese frosting as well for a bit more of that coveted toffee-like crunch. Now is the time to call your best buddy and make a pot of coffee. Banana bread cinnamon rolls are essentially the edible manifestation of all my fondest dreams. Surprisingly, these rolls are not overly sweet. In fact, their level of sweetness falls more in line with that of banana bread than cinnamon rolls. Nonetheless, I like them best with a steaming mug of strong coffee. They may have been a long time in the coming, but now the recipe is all yours and I hope you love them as much as we do. The weekend is just around the corner and it is never too early to start planning Saturday's breakfast, if you catch my drift. I already cannot wait to make these again. In the bowl of your stand mixer combine milk, sugar, yeast, bananas, vanilla extract, egg yolks, flour, and salt. Using the paddle attachment, combine on low speed for 1 minute. Step away and allow the dough to rest for 15 minutes. Fit your stand mixer with dough hook and add the softened butter. Kneed on medium speed for 8 minutes, until the dough is smooth and pulls away from the sides of the bowl. It will still be very soft and sticky, but resist adding additional flour. Coat a large bowl with nonstick spray. Turn the dough onto a floured surface and form a large, loose ball. Place into the oiled bowl and cover loosely with plastic wrap. Allow to rise in a warm place for 1 hour. While the dough rises, prepare the praline and filling. Combine sugars, milk, unsalted butter, vanilla extract, and walnuts in a heavy bottomed 3-quart saucepan and set over medium-high heat. Fit the pan with a candy thermometer. After the praline has cooled, break it up into pieces and place in the work bowl of your food processor. Pulse until the mixture is in fine crumbs. Store in a ziplock bag until ready to use! Cook's Note: You can make the praline up to three days in advance. In a small bowl, use a fork to combine cinnamon and brown sugar. Coat a 9x13 pan with softened butter. After the dough has doubled in size, remove from the bowl and place on a well-floured surface. Gently roll the dough into a 15x12 inch rectangle. Cook's Note: This dough is very soft so you will want to work carefully as you roll and fill. Just take your time and be generous with the flour so that there is no chance of it sticking to your countertop. Rub the surface of the rectangle with softened butter and sprinkle with cinnamon and brown sugar mixture. Spread the crumbled praline over the surface of the dough and pat down softly. Working lengthwise, roll the dough towards you, tucking it under itself so that the roll is tight. Cut the roll into 10 even pieces and place the rolls in the buttered pan. Cover loosely with plastic wrap and proof for 40 minutes. Bake the rolls for 25-30 minutes, until deep golden brown in color. The rolls may look as though they are getting too brown, but trust me, they will not taste burnt! This dough has a high sugar content so it will brown more quickly, but the centers still need time to cook through. Allow the rolls to cool slightly while you prepare the frosting. In a large bowl, beat cream cheese with an electric mixer for several minutes, until fluffy. Slowly beat in confectioner's sugar until fully incorporated. Mix in vanilla extract and walnut praline. Spread the frosting over the warm rolls and serve immediately. Enjoy!